Most people believe that the only valuable life achievement of a disabled person like me (non-speaking Autistic with high support needs) is “to be independent”. I already wrote about how the concept of independence is ableist. In short, it is not our ability to live by ourselves, or to care for ourselves that makes us “independent”. Being an independent thinker is the only real independence. children’s stories, while praising ABA for helping their children “succeed” and “become independent” – meaning having their own place, and doing things like dressing themselves. Since I know some of these parents in the face-to-face world, since I have met them and their Autistic children, I want to point out the biggest flaws in their assumptions, and the biggest, most dangerous learned “skill” of ABA. First, I am basing this article on what parents have told me, and publicly shared, about their adult Autistic children. This is already a problem. Why are the parents sharing these stories? Aren’t the Autistics they talk about “independent”? Shouldn’t Autistics tell their own stories? Should independent Autistic adults choose if, and when they tell their own stories? Second, I see parents telling their “independent” Autistic adult children things like “say hello”, “ask your friend if they…”, “look at your visitor”. Where is the self-determination, the freedom to interact, or to not interact? Why are they being told to look at people without any thought about their desire to look at someone? How is this coaching considered “independence”? I also met with parents and their Autistic adult children, and had parents correct me, in the middle of the conversation, that their adult children “always use Person First Language”. Why is this even relevant? We should be allowed to use whatever language we decide when speaking about ourselves. The Autistic person never “corrected” me, or asked me why I use Identity First Language. They didn’t tell me it bothered them that I was using Identity First Language. The parent was bothered though, and felt the need to point out an assumption about their adult child, without even consulting the adult child. One thing all of them had in common was years of ABA. They were all nicely compliant, never resisted commands, never disagreed with their parents, never said “no”. Maybe they were overwhelmed, like I often am, but they complied with a somewhat forced interaction with me. 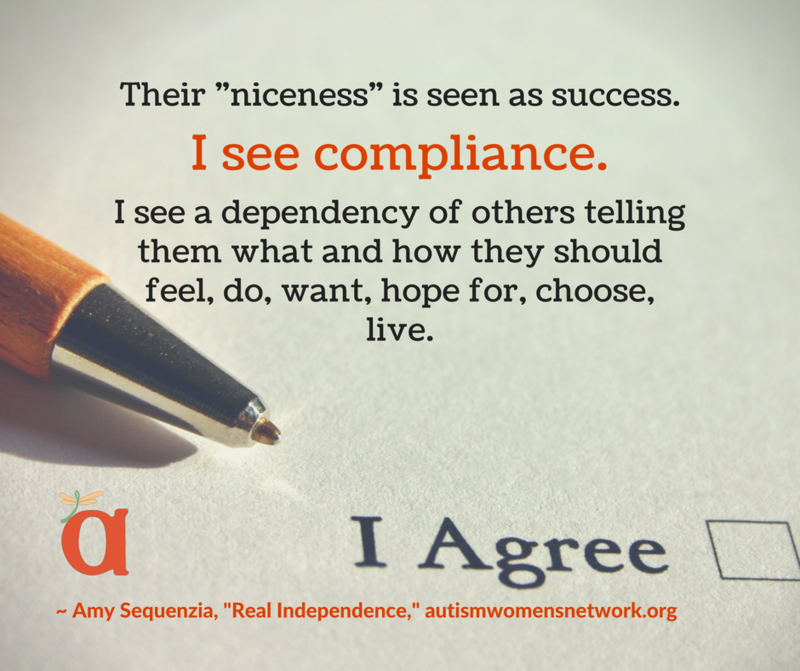 This is the dangerous “skill” that ABA teaches Autistic children: the need to be agreeable and compliant. If an Autistic child is taught that saying “yes” gives them rewards, while saying “no” brings more drilling, more testing, more “convincing” from the ABA practitioner, that child will grow up to be an adult that avoids expressing their own thoughts freely. They will always seek the approval of a parent of someone assumed to have more “authority”. Their “niceness” is seen as success. I see compliance. I see a dependency of others telling them what and how they should feel, do, want, hope for, choose, live. The Autistics adults I’ve met live in their own place, they can work, some can cook a meal. They can dress themselves, they are safe when walking on busy streets. That’s independence, right? Actually, it is not. There is a lot they achieved and probably some of it is because of their own developmental journey but their parents still micromanage every aspect of their lives, including dictating what activities they can participate in, who they can have as friends, where they can go. So, these “Independent Autistic Adults” can do a lot of things with very little or no support, they can “fit in” the neurotypical society, but they still cannot make real independent decisions about their lives. Their parents decided that they should follow the same life trajectory as their neurotypical peers, even though they are not neurotypical and maybe don’t want to do things “the neurotypical way”. I understand the need for safety, the need for a trustful staff or support person. But living on one’s own without being able to make one’s own choices, and even making their own mistakes, is not real independence. Not knowing how to choose, not knowing that we can and have the right to choose is what ABA teaches. It teaches Autistics to emulate neurotypicality, while rejecting and/or hiding their “autisticness”. That’s not success. That’s a dangerous failure. Independence is a myth imposed on us by a normalizing society. It is ableism. I have an independent mind, and I practice interdependence. That’s how I lead my life, that’s how I make my choices – with people who will keep me safe, support me, enjoy my company, value my input, allow me to disagree, learn together, share experiences. It is not always easy, it can actually be very difficult sometimes. But it is possible, and it is real. Yes, this happens. But that’s not my story to tell. It is their story to tell, so you will have to ask them. They also have an independent mind. Excellent piece. In particular I am with you on the language we use to describe ourselves, in two ways: first of all I always refer to myself as an autistic person not as a person with autism, and second it is OUR choice how we refer toi ourselves. Where are the resource for parents to teacher their autisic children both necessary life skills and independent higher order thinking with quality of life? Honest for serious question. Where is the autisic person approved alternative to ABA? Why do parents always have to do something or have a resource? No one in my family has ever had any form of therapy focussed on their ASD, yet here we are, a happy family of four! The adults work and have hobbies. Our children develop and grow while we try to reduce the impact of the stress of neurotypical society on them. I guess our autistic-approved alternative is to love them and enjoy spending time with them? What a fantastic response, Rebecca. I wish every ‘Autism parent’ would hear this. Although I’ve never had ABA, I have certainly had a therapist discourage independent thoughts and feelings. She constantly scrutinized and corrected my body language, the way I spoke, and even my likes and dislikes. She would ask me how I felt about experiences I’d had, but when I answered truthfully, she seldom seemed to believe me. She would ask the question over and over until I said what she wanted me to say. It was terribly confusing. Sadly, I started to hide my real thoughts and passively agree with her, to avoid being constantly second-guessed. It still hurts to think about some of the things she said to me. We have been told over and over that ABA is a miracle therapy that will make everything so much easier. I’ve read the stories of autistic adults that claimed the exact opposite. Ben still does not have ABA. Thank you for this post. It reinforces my choice to let Ben grow into an autistic adult that is free to make his own choices. I appreciate your concerns regarding ABA. Having been trained in ABA techniques prior to being diagnosed with autism, I can attest to the emphasis on compliance in some situations. Just because someone can be trained to learn a behavior doesn’t mean they should. I also disagree with the notion that 40 hours of ABA a week is “necessary” or that it needs to be done for years and years. From a research perspective, I find Lovaas’ study to be methodologically flawed and lacking in support of these views that perpetuate the ABA field. The most I’m willing to take away from the behavioral perspective is that all behavior has a function (even for neurotypicals). I do believe as you’ve said previously that “behavior is communication” and most “problem” behaviors can be addressed by simply giving the individual access to communication that works for them. I fully support ACC in whatever form works best for the individual, not what is best for the school or the clinic. If a child is refusing to use PECS, don’t make them use it, find another form of communication that the child prefers! Because I was diagnosed as an adult, I still have much to know about the autistic community, despite growing up with an autistic brother. As a teenager, I was always comparing myself to others, angry that I wasn’t as “independent” as my friends. I didn’t get a driver’s license until I was 21 and I didn’t move out of my parent’s house until I was 22. I’m a second year graduate student now and some people may call that independence, but I know I will always be looking to other people for insight on the social world. I prefer the world “autonomous” rather than independence because it shows that I am my own person that can make my own decisions, but may still seek support from others to survive. With people out there thinking that I shouldn’t be a practitioner (because of my autism), I need support from others to prove that I can and should be a person that works with autistics. We need autistic practitioners and your post shows why. I want to represent the autistic community, and the only way I can do that is by advocating for supports that respect the rights and dignity of autistics. I really like your choice of “autonomous” instead of independent. Independence is something that many value and strive for in the US, but indeed the reality is that humans need other humans, no matter what the conditions. I once heard a psychologist say that in today’s world we are able to live alone, technically not needing others, but the reality is that that is not healthy for our souls. Humans are meant to be interdependent. Thank you, thank you, thank you for your article! I was recently diagnosed as autistic as an adult, and my son (14) has also been diagnosed as autistic. I am new to all of this. My son has behavioral problems, and his pediatrician, who specializes in behavioral health, just sent a referral out for him to be placed in ABA therapy. In fact, they called at an inconvenient time last week, and I have been unable to return their call as of yet. I thought it would be similar to OT, which he has tried in the past, but maybe more sensory friendly or something. I am so thankful I came across your article! You have no idea how thankful! You have probably saved us a lot of heartache. I will call the ABA office back on Monday to tell them we are no longer interested. I thought it would help him grow into himself, not destroy him! I would never want to put him through something so detrimental to who he is! Again, thank you so much for writing this piece. I had no idea. You have saved my family.